President Mahinda Rajapaksa will leave for Russia on Tuesday to seek both Moscow’s support for Sri Lanka and brief world leaders on key issues facing the country. He is scheduled to have one-on-one talks with President Dmitry Medvedev. He will thank the Russian President for the support extended by Russia after the release of the UN Advisory Panel’s report on alleged war crimes in Sri Lanka. Rajapaksa’s talks with other world leaders will take place when he meets them at the St. Petersburg (former Leningrad) International Economic Forum. The theme of the conference from June 16 to June 18 is the definitive platform on Russian and Emerging Market Economic Environments. It will focus mainly on Russia’s modernization. 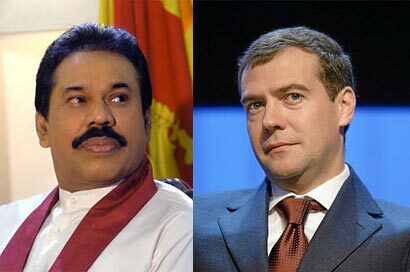 External Affairs Ministry sources said yesterday President Rajapaksa would brief President Medvedev on matters arising from the UN Advisory Panel’s report on alleged war crimes in Sri Lanka. He would seek Russia’s support should the matter come up in any international forum in the future, these sources said. Among the world leaders taking part in the St. Petersburg Forum is Chinese President Hu Jintao. An official statement from the sponsors of the Forum said a large number of Chinese and Asian business leaders from a wide range of industrial sectors were expected to participate. Well.. This’s going to happen in the very right time.! Just after we got the WORST response from tamilnadu. What we need is closer defence and trade links with Russia as well as China, to counter attacks from imperial West and its stooge, India. India has always been our enemy and will remain our enemy. India treats us with despise as if SL is their ‘colony’. Let us send India a clear message that SL is not their ‘colony’. If we have the loyal backing of Russia and China against our enemies then their veto powers will ensure no pressure can be brought on SL to divide the country as demanded by eelamists. We will never succumb to such pressure and will always safeguard our historical sovereignty. Our Hon President defeated the world’s most brutal terrorist organisation despite the covert and open backing the LTTE received from imperial West and India. SL is not going to back down now under pressure from Imperial West, India and UNSG. SL is not Libya. I have no qualms in having certain extreme views in that Prabha and his types should have been erradicated after been given many an option in the past to use proper negotiation strategies. There is no point giving them a breathing option in the last minutes when they face deet just to allow them speace to re-gather / re-cuperate and then attack again. This will be a point of debate till the end of time.. similar to should we have allowed Wijeweera to live, should Osama have been captured etc. etc.. Being a professional having worked in many countires both in the West and East it is sad to see how SL is viewed as a terrorist state. This government has ruined the only golden chance of reconciliation and progress we had in many years. This country will move slower into an abyss and our children will not only bear the brunt of these ramification but also curse us for not having done right by society. Saying thank you to the Russians for the few words of support offerred by its Ambassador is not going to get us anywhere. All countries in the world belong to the international community. Towing the China line today and the Russian line tommorrow and the Libyan line next week will also not get us anywhere. The British taught us the principles of divide and rule and we appear to have become masters of it. The principle of divide and rule is not a sound principle; divison does not you anywhere; unity does get you somewhere. The kremlin is the only world capital where our beloved leader can visit. He is welcome nowhere else. The pariah state is dragged down by its criminal leader. Are we becoming Cambodia under Pol Pot? Or for that matter, are we becoming Egypt under Hosni Mubarak or Libya under Muammar Gadafi? I am almost ashamed to be a Sri lankan now. Julian, Your prejudice against MR is seen very well here. You are saying MR is a criminal without filing any criminal case against him, and in the same time you are saying you were a professional. Both cannot be true. Haveing served in the west as you admitted, you are pretty surely brains washed to appreciate every thing the west does. That is also not very professional. As an example, you never questioned why the west did kill unarmed Osama Bin Laden without a public and fair trial. You never questioned why the americans never allowed journalists to enter american prisons in Cuba? You never accused US and UK leaders as war criminals when they killed millions of civilians in Afganisthan and Iraq and also Libya when they don’t even belong to them. Try to compare that to killing people in your own country ! The beauti is that those are the ones who preach about war crimes to Sri lanka. And you are also asking why Sarath Fonseka is in prison when he was sent to jail by a court. If Sarath Fonseka was sent to jail by the US, then you will not have enough courage to ask the same question. You are saying terrorists are roaming free in Colombo. Who are they. To me none of the current terrorists are freely roaming in Colombo. There may be some “former” terrorists but they are not terrorists any more. Just like if Prabakaran took opportunity extended by the various governments then he could have been the chief minister in Jaffna. If terrorists are freely roaming there should be many deaths to civilians. Without any bombs going you cannot claim terrorists are there, if you say you cannot be professionsl. Our leader may not be welcomed by those western hipocrates and it is a good thing, because we do not need to sleep with dogs. If Kremlin and Beijing are the only good friends, so be it. It is better to have few wise friends rather than having thousands of foolish, misleading and selfish friends. MR is million times better than you Julian, compared to what you have contributed to your motherland other than crying foul and serving the west as you have already said you have done. Prejudice will not bring us anywhere, however logic and wisdom will bring us somewhere. JS has tied himself in a knot. MR is an honourable man who defied the imperial West and India and totally eliminated VP/LTTE. We are eternally grateful to him and his brothers three for this alone. JS, please do not compare Hon MR to Pol Pot(a stooge of USA), to Hosni Mubarak and other despotic rulers, who were stooges of USA and Britain. Hon MR is no one’s stooge. I am very happy for the course he is taking to re-mobilise and win the total support of Russia and China in UN Security Council. Hon President has anticipated the next move of imperial West. They will try to pass a resolution in UNSC, on the basis of the private biased report of UNSG (the imperial West stooge) for military adventure of UN troops against SL to seize the so-called ‘war criminals’. They have already labelled MR, GR, and a few Generals as war criminals. They are doing this in revenge for daring to defy the orders of the imperial West not to eliminate VP/LTTE. The real war criminals are US Presidents, past and present. Hon President is doing the wise course of anticipating the next move of evil imperial West. Hence the urgent necessity for closer ties with Russia and China, including defence ties against possible invasion by India and the imperial West using UN and NATO troops as done in Afghanistan, Iraq and in Libya. They are stirring up trouble in Syria as well, while stifling the legitimate aspirations of the vast majority of citizens in Yemen, Bahrain and Saudi Arabia to topple evil regimes propped-up by evil imeprial West. you’re a grand grand child of who betrayed everything in SL to westerns. Same time the all bugs like you’ve under gone a slavery of “gods myth” so you’re all misbelievers who can’t see anything as it is. You’re blind fools who can’t see what did with few words of Russia & China. So these talks are useless with you. !